﻿ Free M4A to MP3 Converter - Convert M4A to to MP3 Free! Free M4A to MP3 Converter - Convert M4A to to MP3 Free! Convert music between AAC, M4A, OGG, MP3 and WAV formats for free! Free M4A to MP3 Converter can accept any combination of AAC, M4A, OGG and WAV audio clips, and convert them into a format of your choice including AAC, M4A, MP3 and WAV. Covering five most popular audio formats, Free M4A to MP3 Converter will cover 80% of your audio conversion needs. If you need the other 20%, check out one of our feature-packed products such as Magic Audio Converter and CD Ripper supporting well over a dozen audio formats. 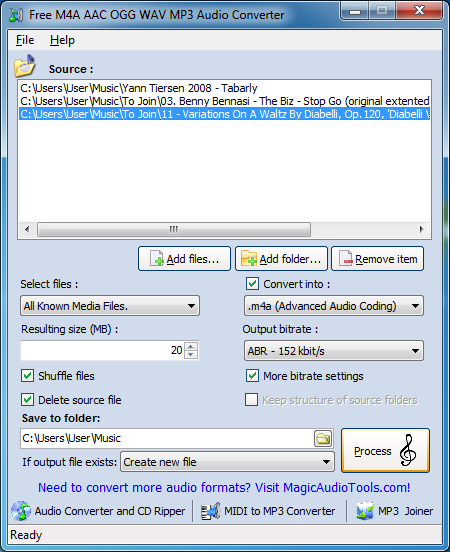 Free M4A to MP3 Audio Converter supports a limited range of audio formats, but does that without charging you a dime. If AAC, M4A, OGG, MP3 and WAV are everything you need, here’s your chance to pick up a great audio converter for absolutely free. Have a bunch of audio tracks downloaded in a bunch of different formats? Having your music collection scattered between the formats may not be the best idea. Duplicated tunes, varying bitrate and playback quality can easily ruin the listening experience. Besides, some players are better off with one format, while others are best with another. Consolidate your entire music collection into a single audio format! Free M4A to MP3 Audio Converter accepts any number of AAC, M4A, OGG and WAV files as an input, producing AAC, M4A, MP3 or WAV files in the output. Its convenient drag-and-drop interface makes the conversion simple and easy. You can shuffle the files or keep the original folder structure, specifying your desired bitrate and sound quality. And if you have audio files in exotic formats to convert, have a look at our other tools! If seeking an ultra-fast audio conversion tool for the most popular audio files, make sure not to miss Free M4A to MP3 Audio Converter! How to uninstall Free M4A to MP3 Converter? How do I uninstall Free M4A to MP3 Converter in Windows Vista/Windows 7/Windows 8/Windows 8.1/Windows 10? Select “Free M4A to MP3 Converter” and right click, then select Uninstall/Change. How do I uninstall Free M4A to MP3 Converter in Windows XP? How do I uninstall Free M4A to MP3 Converter in Windows 2000? How do I access the Free M4A to MP3 Converter download for PC? It’s easy! Just click the Free M4A to MP3 Converter download button at the page. Clicking this link will start the installer to download Free M4A to MP3 Converter free for Windows. Will this Free M4A to MP3 Converter download work on Windows? Yes! The Free M4A to MP3 Converter download for PC works on most current Windows operating systems.